Today is another request, I was asked about armoured cars. Reconnaissance units often roam ahead of the main forces, but don't hang about once the heavy mob show up in tanks, so finding accounts of battles is actually quite tricky. However I did find the following video from a British army training film. This is an organisation from earlier in the war. The motorcycle elements of the platoon were removed for the later war. 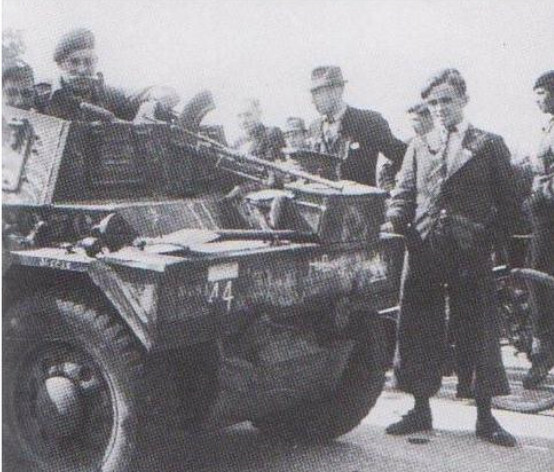 To give you some idea of the life of an armoured car unit here's a series of extracts from the 11th Hussars war diary. I'm scouting for Tigers! Maybe a captured dingo. Or maybe the Autoblinda Lince. An exact copy of the Dingo built by the Italians. Which goes to show you how useful a little vehicle the dingo was. During the 21st Army group's advance across Europe after D-Day one of the major tasks armoured car units had was to find suitable bridges. 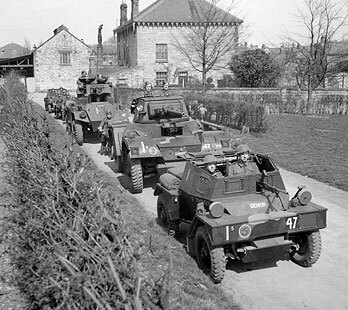 Shortly after they arrived in Normandy the 2nd Household Cavalry squadron was due to take part in Operation Goodwood, however due to the nature of that battle the light armoured units were not deployed. The next major operation was Operation Bluecoat, and this time the 2nd Household Cavalry were deployed. Lieutenant Dickie Powell, of C Squadron was leading his armoured car troop of two Daimler Dingos and two Daimler Armoured Cars through the narrow Bocage country. The rear most Daimler broke down and blocked the road, and prevented the Dingo bringing up the rear from passing. Lt Powell continued on with his mission. Their first contact was a German sentry who tried to flee, but a grenade from the Dingo stopped him dead. Grenades were often used as a random explosion near the front is hard to identify and reduced the risk of giving the location of the patrols away. Coming round a corner they quickly came across a large number of anti-tank guns, however the patrol managed to charge through the AT gun's killing zone, leaving a few more grenades with the German gunners. Still probing forward they found a bridge over the River Souleuvre still intact, this bridge was six miles behind enemy lines. Unbeknownst to Lt Powell however, a number of Panther tanks were covering the bridge. The Daimler set up covering the bridge, and the tiny Dingo scuttled across. Quickly hiding in a bush the crews from both cars dismounted and with only small arms they held the bridge, with two men at each end. The 5th man stayed in the Daimler to use the radio and try and get the vital information through to headquarters. The dismounts had to dispose of several Germans quietly, holding on for several nerve wracking hours until an armoured spearhead arrived. Born on February 2nd 1923, Rupert Buchanan-Jardine was also serving in the 2nd Household Cavalry, as a Lieutenant in D Squadron. As well as being a keen rider, Jardine spoke fluent faultless German, having picked up the language from his German nanny. He'd joined the Cavalry straight from school due to a love of horses and riding. However his first taste of action was when a German bomber scattered its payload of incendiaries over his boarding schools roof. Jardine was part of the fire watch and had scaled up onto the school's roof to tackle the fires. He was commissioned in 1942, and then deployed with the 2nd Household Cavalry to Normandy. 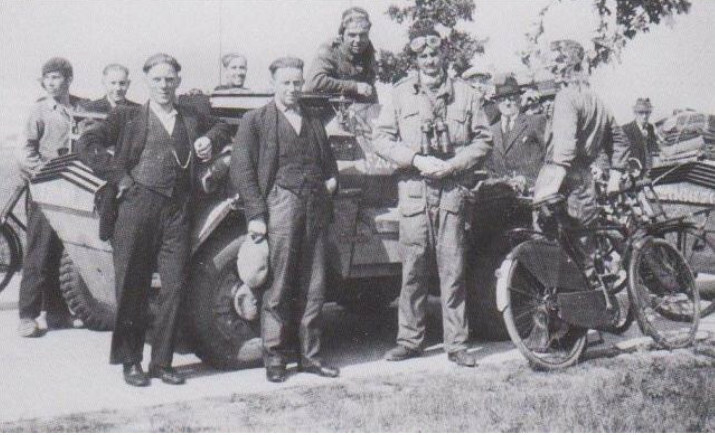 Lt Jardine (Standing outside he Dingo), with the group of Dutch Civilians. In early September Lt Jardine was the first Allied soldier to enter Holland. 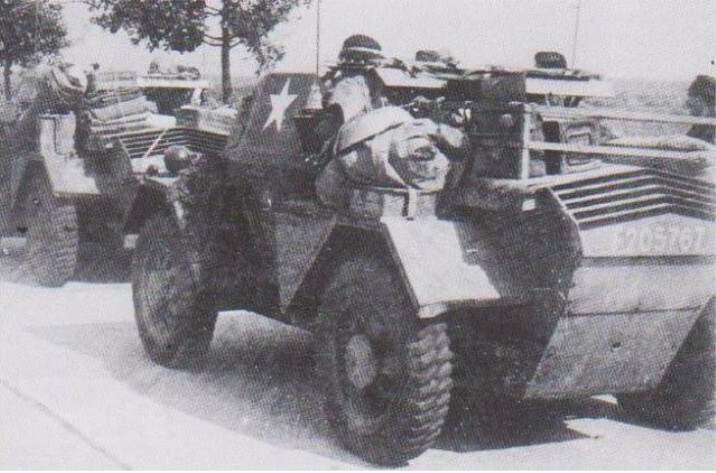 Riding in a Dingo, and accompanied by a Dingo from another troop Lt Jardine led a patrol into occupied Holland to check on a bridge south of Eindhoven. Shortly after crossing the border Jardine came under heavy enemy fire. Like Lt Powell Jardine used the small size and the Dingo's excellent mobility to just charge through the lines. The tough armour on the Dingo kept the German bullets away, and its speed meant that the German anti-tank weapons never came close. The Crew of the other Dingo in Lt Jardine's patrol. Again Photographed with the Dutch Civilians. Lance corporal of horse Brook (The one with the mosutache big enough to put the fear of god into the Germans! ), and Trooper Bateman. 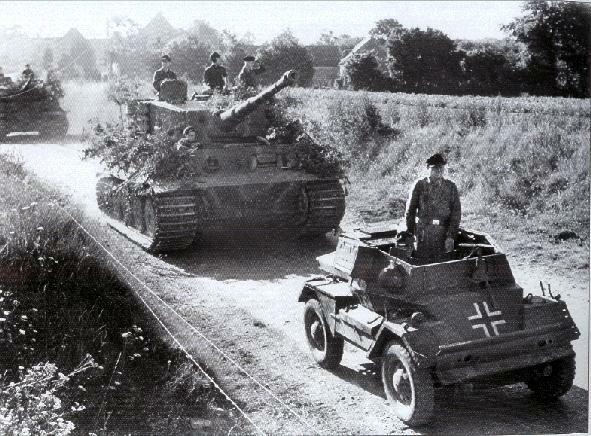 Five miles later they approached the bridge they stopped to observe and they saw a Panzer IV guarding the bridge. They remained in that position for about half an hour. While waiting a crowd of local civilians approached them thinking liberation had come. One of the locals had a camera, which is where the photographs here come from. With the Germans approaching, time to leave. The civilians warned Lt Jardine that the Germans were approaching and trying to catch them after blowing through their front line. With this warning Lt Jardine led his patrol back towards Allied lines. 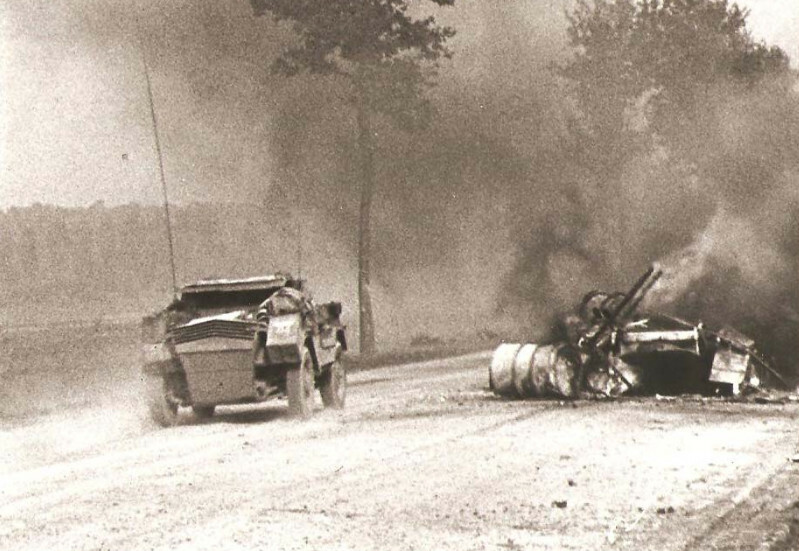 Again they roared through the Germans that were hunting them with no casualties, although almost every item carried outside of the armour was shredded by German small arms. Incensed by the escape of the patrol the Germans shot several of the civilians. For his role in this reconnaissance he was awarded a Military Cross, and for being the first soldier into Holland, The Bronze Lion of The Netherlands. Lt Jardine used his German on a couple of occasions. Once he was ordered to find out how strongly a town ahead of the advance was held. Instead of a classic reconnaissance which would put his men at risk he simply phoned up the German commander in the next town, and started shouting questions down the phone in perfect German. Amazingly this trick worked and he was able to find out all the information on the strength of the defending forces. Another time Lt Jardine headed into the woods after breakfast to relieve himself. As he squatted behind a tree a German raced up to him trying to surrender. Lt Jardine's only response was "Go and wait over there until I have completed my business!" Lt Jardine retired from the army in 1949 as a Major. He then studied Estate Management and Forestry, before moving back to his family's home in Scotland where he ran their lands, and became master of their hounds. He died aged 87 on August 24 2010.
daimler-fighting-vehicles.co.uk (Note: This is a very good site for all things Daimler armoured car/Dingo related. Well worth a visit) and warlordgames.com.